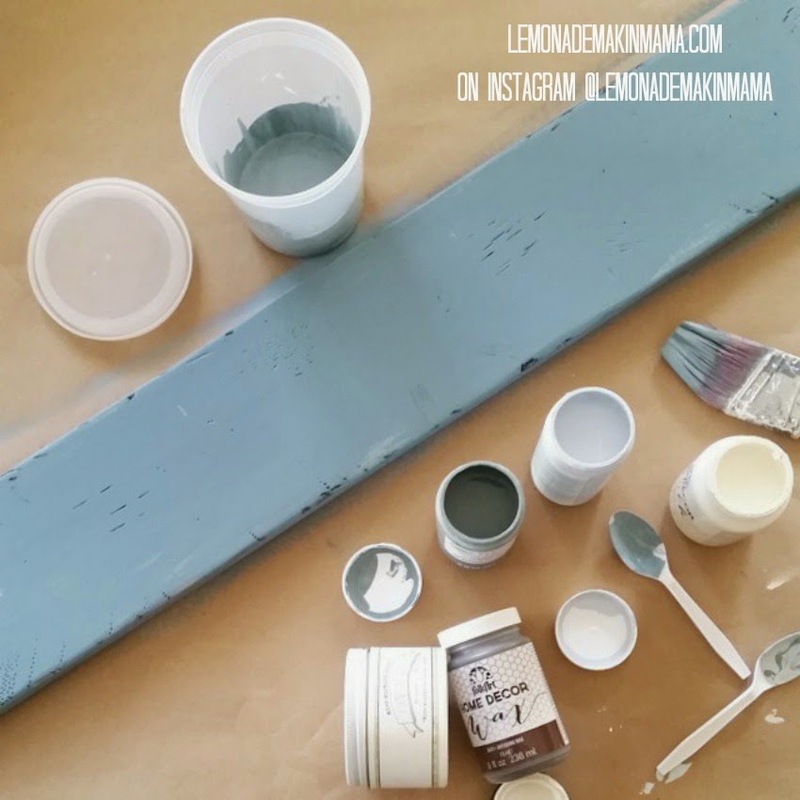 Lemonade Makin' Mama: The Chalkboard Crock pot, etc. 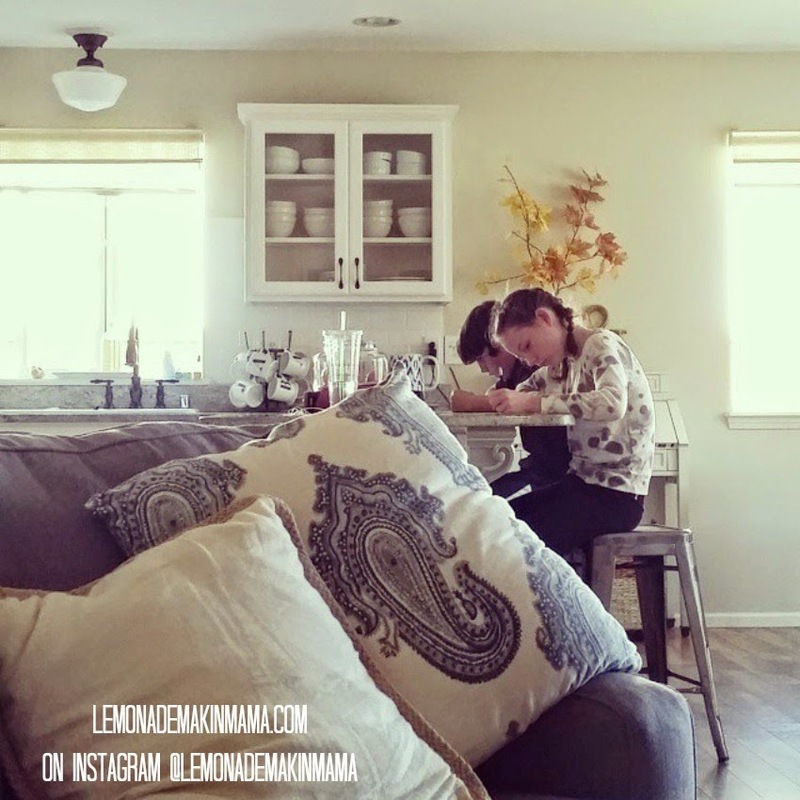 Today I am so excited to share a cute and quick idea with you. 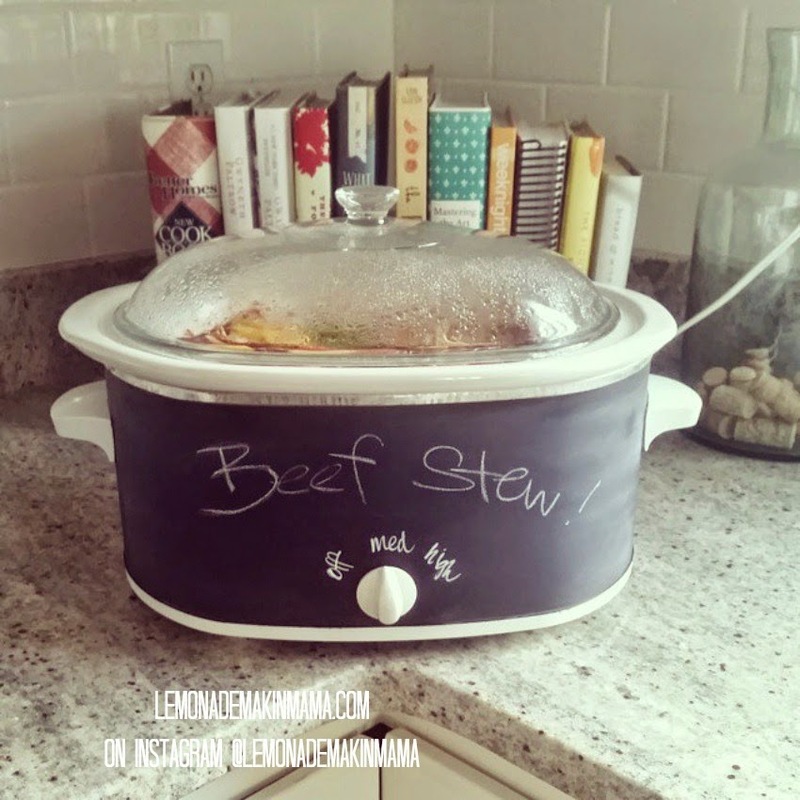 The chalkboard crock pot!! It was a big hit on Instagram when I shared the other day and I got a lot of questions as to how I did this. First of all, it was ugly. So very ugly. Now they make sleek stainless ones with self timers and high tech jazz but until this old school version breaks on me... she's what I'm stuck with. And is there anything better than knowing you've got dinner going at 9 am? I think not. Mine had a removable insert though I'm guessing you could do this on any crock pot since you never fully submerge them in water anyway. Step 1- VERY IMPORTANT- clean all grease off outside of crock pot. Step 2- Tape off every place you do not want painted. I kept the handles and top and bottom edges and knob taped off. I used really good painters tape and had zero bleed through. I recommend spending more to get the best quality painters tape. Do it and thank me later. Step 3- Prime entire crock pot with spray paint primer. (I got mine at Lowes) It is a gray color and I only needed one coat. I let this dry an entire day even though it was dry to the touch. I didn't want any flaking off later. Step 4- Coat with chalk board spray paint (also at Lowes) and let dry 24 hrs, then spray second coat. Let dry another 24 hours. Step 5- Untape and season chalk surface by placing chalk sideways on crock pot surface and rubbing all over, then erasing. **It worked just fine and the heat didn't have any impact on the chalk surface. Overall, I am so happy I did this! School is in full swing. This is a regular sight just before dinner. 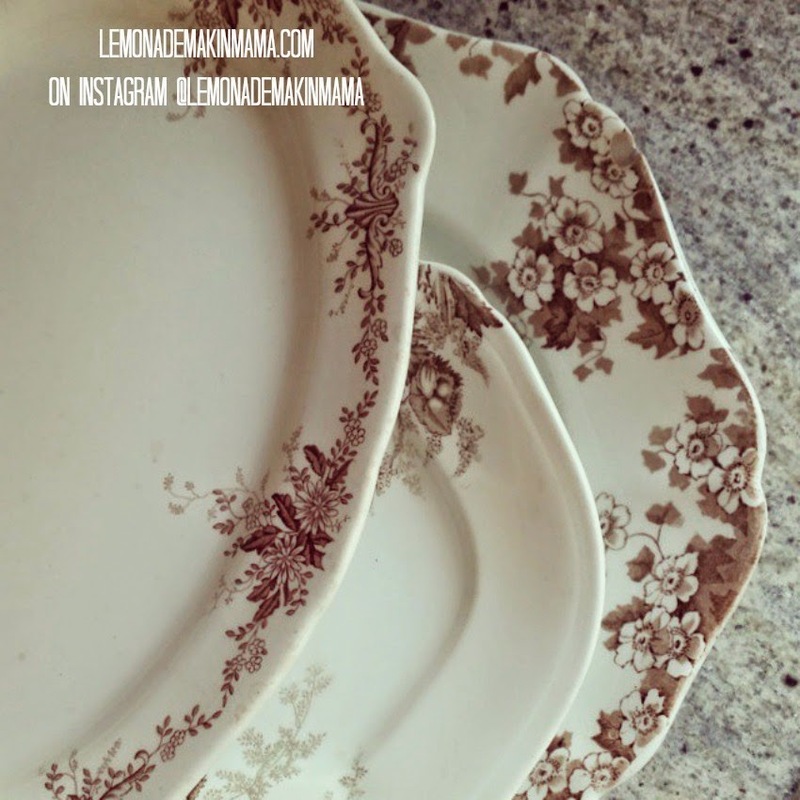 I scored more brown transferware for my collection at a consignment store and if I told you how much they were you would just die... they were SO inexpensive. I couldn't walk away!!! These are big and small platters... Now I'm on the hunt for a few more dinner plates. I love how none of them match! I have a project in the works right now. It took me forever to get the right color but in the end I went with Duck Egg (not pictured) by Annie Sloan. Not sure when this will be finished but hopefully next week! I'll be sure and share when I'm done! Happy Thursday to you all & see you next week with more fun! Love the crock pot. I have a bright red crock pot that I love but when I tire of it I'll definitely give this a try. Did you rough up the surface first? Oh, and happy birth week. When you turn 50 you get to have 50 days of birthdays! The crockpot?? Geeeenius! 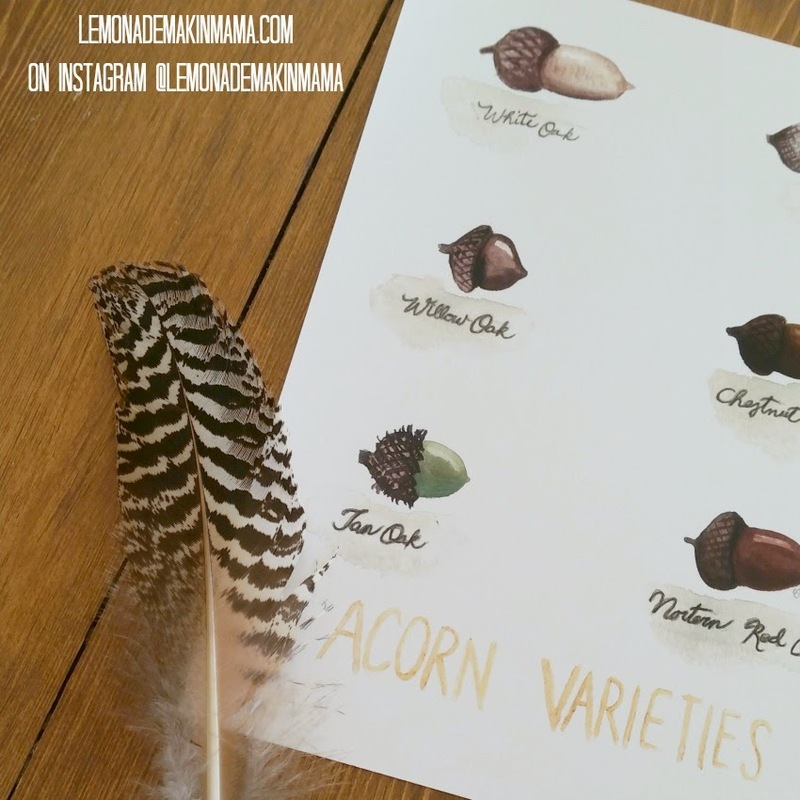 Also, that acorn print might have to come to my house. Also again, I have some serious envy for that brown transfer ware...I've been crushing on that forever! Love the brown transfer ware........:-) Happy Fall! What a great idea! I would never have thought to do this. Thanks for the inspiration! I can hardly wait to paint my crockpots. LOVE this idea. Seriously, I am a happy camper! Have a great weekend! And yes, I learned the hard way that chalk pens can be permanent. I currently have an adorable chalkboard waiting to be repainted in chalk paint because I can't get "Sweet Summer Time" off of it. No bueno! 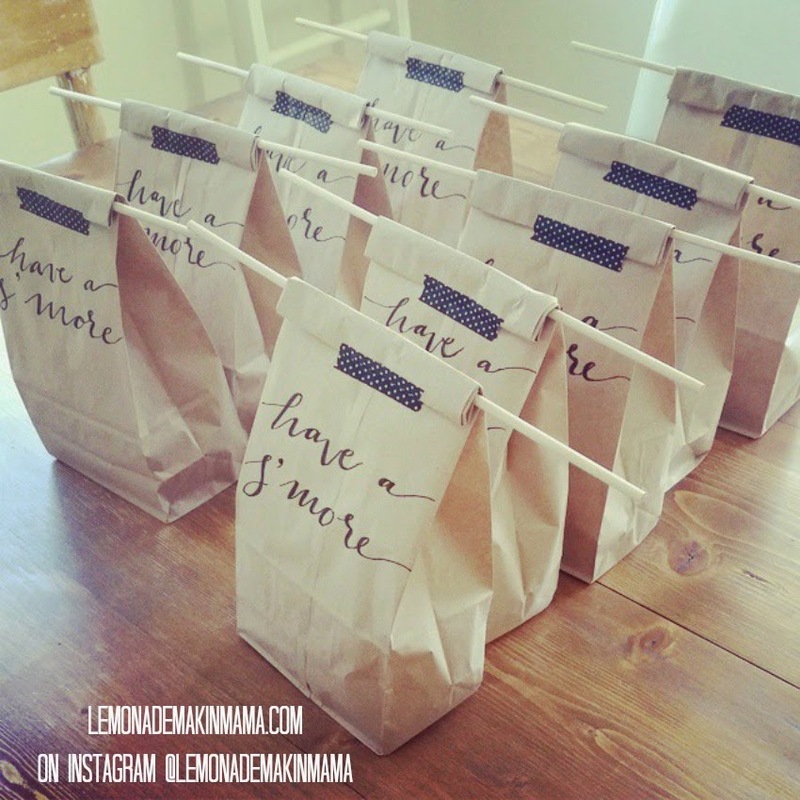 Love the smores baggies, too--may have to borrow/steal that adorable idea! loving your new prints..you know the fall ones are always my personal favorite. I can hardly delay to colour my crockpots. LOVE this concept. Seriously, I am a satisfied camper! Have an excellent weekend!